Marine Corps Air Station Futenma is located on the island of Okinawa in Japan. 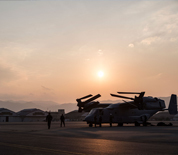 The air station is home to the 1st Marine Aircraft Wing, falling under the jurisdiction of the III Marine Expeditionary Force, with a mission to provide air support to Marine units stationed throughout the Asia-Pacific Region. Two MV-22 Osprey squadrons are present on MCAS Futenma, although other aircraft often use the airfield for joint military and United Nations operations. Every year, MCAS Futenma hosts the Futenma Flight Line Fair, where local Japanese can visit the base to enjoy entertainment and static displays. This MCAS Futenma directory features the critical info you'll need to navigate through the many facilities and recreational opportunities available on base.